The university I worked at this summer, the Indian Institute of Science, is situated on one of the last tracts of most deciduous forest that once covered the city of Bangalore. The disparity between the lush surroundings I worked in and the bare concrete of the rest of the city was a daily reminder of the importance of studying ecology in modern India. At IISc, I worked with Dr. Kavita Isvaran at the Centre for Ecological Sciences. Dr Isvaran works on several wide-ranging aspects of evolutionary ecology, such as mate choice behaviour and the impacts of invasive plants. Our project focused on how ecological context drives adaptations in prey organisms while encountering predators. 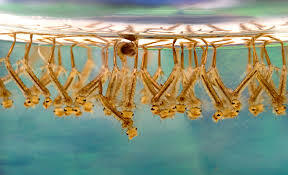 Our study system was Asian Tiger Mosquito (Aedes aegypti) larvae, a species that is a vector for several debilitating tropical diseases like dengue, chikungunya and yellow fever. Understanding the mechanisms they have evolved to deal with predators is important for vector control measures that aim to decrease populations. My project, in particular, focused on spatial scales of avoidance and asked whether the mosquitoes can choose to avoid microhabitats that contain predators. I did this by giving larvae a choice between two habitats: one that contained a caged predator and food and one that contained only food. I then measured the number of larvae that occupied each habitat. I found that the larvae did not show a preference for the side that did not contain the predator, which was contrary to my expectations for the study. This suggests two possibilities: one, the larvae have other strategies to handle predation pressures and two, the caged predator did not signal a large enough threat to the larvae -- perhaps they need more physical cues to elicit a response. Further investigation will have to be done to decipher the mechanisms behind these results. To my mind, my results are indicative of how little we actually understand of organisms that have been studied for decades. The idea that there is always something we may not know is what drew me to science, and biology in particular. My summer internship was thus, a reminder of how much more there is to know about the world around us.